December 2010 as Bill No. 24 in the "Uganda Gazette", No. 72, vol. CIII. Symbols and seals of institution of traditional or cultural leaders. (1) Institutions of traditional or cultural leaders may have flags, anthems, seals and logos. (2) Flags, anthems, seals and logos of traditional or cultural leaders existing before the coming into force of this Act shall continue to be in use. Water is a source of life. The blue, represents the water bodies, River Nile, Lake Victoria, River Mpologoma in the West and Lake Kyoga that surround the region as the unbeatable natural resource endowments that define the economic activity of Busoga. Represents the warm and sunny weather experienced in Busoga throughout the year. Represents the fertile brown alluvial soils found in this Victoria Crescent zone. A variant of the Busoga flag has a white disc with the Kingdom Royal Arms in black and white in the centre. An actual flag in the possession of Professor Michel R. Lupant (President of FIAV) measures 104mm at the hoist, 165mm in length and each of the 3 stripes is 35mm wide (approx.) and the white disc is 44mm wide. The Emblem is 16mm wide at the drums & 30mm high (from the ribbon in the base, to the top of the horns of the crest). Busoga Emblem consists of the royal coat of arms and the tri-coloured flag. The drum like to many other societies in Africa is an instrument used in communication. It is also a symbol of culture. These are war weapons. They are a symbol of power and here they used to connate the leaders role of defending the people. River Nile - Water is source of life. the Nile represents the natural resource endowment of the Busoga.
" Busoga okwisania na Maani" the motto is written in Lusoga language. It is translated in English to mean "Unity is Strength or Strength is derived from Unity" - It connotes the togetherness of the Basoga people at all times of crisis and happiness. Pillars ( in the shield) - These pillars represent the 11 principalities that are the foundation of Busoga Kingdom. These are the families of Gabula, Zibondo, Ngobi, Menha, Luba , Wakooli, Ntembe, Tabingwa, Kisiki, Nkono, and Nanhumba. Five long pillars in the middle represent the five Princes from which the Kyabazinga is elected. They include: Gabula, Ngobi, Tabingwa, Zibondo and Nkono. 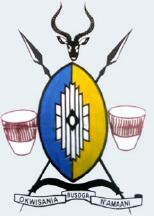 The Knot (In the centre of the shield) represents the Kyabazinga Isebantu as the fulcrum of authority and the chief binding factor of Busoga. The coloured Arms of Busoga Kingdom (Uganda) seem to be the Royal Arms, the Black &White seem to be the State Arms. I have been waiting for the Busoga Flag from my contact for 6 months. "The region of Busoga is situated in the South-Eastern part of Uganda. Population 2.1 Million Area 7100 sq. miles Capital, Jinja, the former industrial capital of Uganda and situated on the source of the River Nile. The Basoga are the eastern neighbours of the Buganda. They occupy the region between Lake Victoria and Lake Kyoga in the present districts of Jinja, Kamuli and Iganga. Due to the continuous movements and intermingling of people within the Basoga region, the history of the Basoga is complex. It can be asserted, however, that the earliest inhabitants of Busoga belonged to the same Bantu group comprising the Banyoro and the Buganda. Their origins can therefore be traced, like other Bantu groups, to the Katanga region of Central Africa. Tradition holds that the earliest inhabitants were the Langi, the Iteso and the Bagisu. They were later engulfed by migrants from Buganda. The earliest settlers in Busoga are said to have occupied the lake-shore areas of modern Bukoli. Nanyumba's Banyole are believed to have been among these earliest inhabitants. These early settlements took place far back in the 14th century. They were later joined by other people from the Mt. Elgon region. These people are said to have been led by Kintu and are said to have settled in Bugabula and Bulamogi. They were later joined by others from Budama and some from Kigulu in Kenya. Lusoga language closely approximates to Luganda, especially that spoken by the Ssesse Islanders. Many Lusoga dialects exist. However, the Buganda influence over Busoga is such that Luganda tends to be used as a lingua franca in Busoga more than Lusoga itself. Within Busoga, there are so many dialects of the Lusoga language that it is difficult to reach agreement on the correct way to spell or pronounce certain words. For instance, in the north of Busoga, there is a distinct H but people from Southern Busoga do not accept this H as being appropriate to the Lusoga Language. There was no paramount chief over the whole of Basoga. The Basoga were organized into principalities or chiefdoms under the sovereignty of Bunyoro and later of Buganda. In the early times, the death of a chief was first reported to the Mukama of Bunyoro who would send the funeral bark cloth and all the necessary requirements for the burial rites. In fact, the southern principalities are said to have been ruled by dynasties whose origins could be traced to the east and Lake Victoria Islands. During the 19th century, Buganda influence very greatly increased over the southern Busoga principalities. The northern principalities still had a connection with Bunyoro and indeed their language contained many Runyoro words. In 1906 the British protectorate accomplished an administrative amalgamation of the multifarious kingdoms of pre-colonial Busoga into a single integrated structure. Ezekieri Wako was appointed the first Isebantu Kyabazinga." I have still not received anything on the Busoga Flag from my contact in Jinja, Busoga Kingdom. Regarding the Kings or Princes , I have a list of about 55 of them. It will be noted that Mwami = King (Rwanda, Burundi, and about 8 Mwami in Haya District & in Districts in the N.W. of Tanzania (when it was Tanganyika, all aboilisted in 1962), with a few holding that title in Uganda). Omwami is the local spelling of Mwami. Like Mugabe (locally Omugabe in Ankole, and in certain States in N.W. Tanganyika), Mukama (locally Omukama in Toro, Bunyoro-Kitara, and in certain States in N.W. Tanganyika), Kabaka in Buganda.